We've selected these 10 vintage caravans ranging from £400 to £4000 - some that are ready to go and some that need a bit of TLC. Summer is almost here and the 1970s are &apos;in&apos; again, so to match your new or dug-out flares here are 10 vintage caravans on eBay that will be sure to complete the look. Some are already styled by the sellers and some need a bit of TLC, but with the right buyer you could have the perfect little camper for the festival season and be ahead of the curve - because these are sure to take off over the next few years. These particular items classed as &apos;shabby chic&apos;, &apos;vintage&apos; and &apos;retro&apos; are ever present on auction website eBay and here are 10 of the more interesting ones. 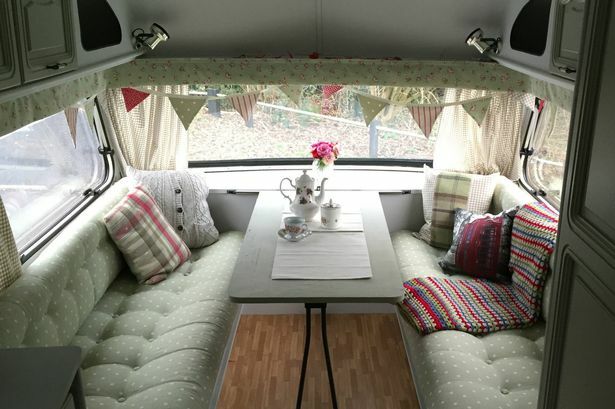 Described as &apos;shabby chic&apos; by the seller this one is a prime example of what can be done with a blank canvas, they have turned this 1990 Abi Daystar in the perfect vintage camping experience. Search eBay for: "Shabby Chic Caravan - Glamping Camping Vintage"
This one is called &apos;Queenie&apos; and is a 1977 French caravan that the seller aptly describes as a &apos;time warp tourer&apos;, it is unrestored but as you can see it looks authentic to the period and is great for anyone who loves the 1970s style. Search eBay for: "Vintage Classic Retro 4 berth 1978 La Royale Caravan"
A 1961 Eriba known as &apos;Pan&apos; now is a star among caravans as it has gone to many vintage shows where its rarity has attracted attention from onlookers wanting a photograph. It also comes with the original awning and interior from when it was first constructed! This one is a real throwback. Search eBay for: "Eriba faun/pan vintage retro caravan"
This cute mint green camper is named Olive and she is a 1969 Opal Topaz. The seller has already worked on it adding the flower patterned chairs and bunting but the advert says she will need &apos;attention and work&apos;, but the potential is there, once it is fixed up this will be one to show off. Search eBay for: "Vintage Caravan 1969 - retro classic shabby chic opal topaz"
This petite camper is named &apos;Wendy&apos; and is a fully restored, 1973 &apos;shabby chic&apos; camper as the seller says. The lucky bidder of this one will also get the matching curtains and bedding along with a dining chair and table set for alfresco eating. Search eBay for: "Vintage caravan - fully restored 1973 Thomson Glen 2 berth"
Compared to the others on this list this needs some serious TLC but it could be the ideal summer project for an individual who wants to start from scratch and create their own vintage camper. However you had best be quick as this item already has 65 watchers on the auction site proving to be popular. Search eBay for: "Vintage caravan for restoration, in need of TLC"
The Ace Pioneer 1965 is described as a &apos;dream to tow&apos;. The seller says it has been reupholstered but the original 1960s curtains remain along with real wool rugs, a vintage radio, and 1928 to 1960s bunting with each flag showing a part of caravan history. Search eBay for: "Vintage Ace Pioneer Caravan 1965 4-Berth Retro Classic Resprayed"
Mildred is a light camper that has travelled all the way to Italy. It was a vintage project for the seller but they now want to move on to their next project. For the lucky buyer they won&apos;t need to do much to Mildred, only enjoy the retro camper in all its beauty. Search eBay for: "Vintage caravan alpine sprite 3 berth"
Although it needs some TLC this Yvonne Mustard is only one of a few hundred in circulation. The rare Dutch 1967 caravan comes with a sun canopy and its interior and exterior has that authentic retro look. This partially renovated 1970s Thomson Glen 4 is a kitsch catch on the inside and only priced at £850 at the moment. If you don&apos;t want a summer project and you&apos;re ready to get away then this camper is perfect. Search eBay for: "Vintage Thomson T-Line Glen 2/3 berth 1970s"